Yes, I am so proud and give well deserved props to super studs like Tatyana McFadden, Alana Nichols, Steve Cash, Jessica Long, Josh George, and Chuck Aoki. However, I do want to give a little shout out to everyday athletes who are not always in the public eye or looking to conquer the world, but simply just use everything they have in order to compete at their highest level. With that being said my favorite athlete is about a young woman that just simply likes to run every now and then. Incredibly, running for her is not very simple. While her story is not meant to inspire you, or to make you want to donate to a specific cause, it just more than anything verifies to me the importance of having a healthy active lifestyle. More importantly, it shows how it is your responsibility to embrace this lifestyle. People with disabilities are the most underserved population in the US. 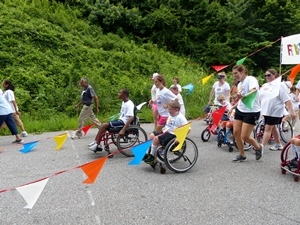 There are 57 million people with disabilities and 54% do not participate in exercise or physical activity. Not to be outdone, there are over 5.2 million children and youth with disabilities and only 38% participate in physical activity. At times it appears that this issue is not going to be resolved anytime soon. Unfortunately, this inactivity can lead to secondary health conditions such as obesity, diabetes, and heart issues. So, what is a person to do? Where can one go? What can a person with a disability or a chronic health condition do to prevent or deter a certain impending doom and gloom? Well, I would listen to the story of my favorite athlete. Her story may not solve all the health issues of people with disabilities and chronic health conditions but you could just image what changes can be made if every person with a disability looked to embrace the responsibility of dealing with their own body? To have the sheer will to push their body to unknown extremes, despite any obstacles visible and invisible. At the end of the day, it is your responsibility to do everything you can to lead a health active lifestyle, no matter how difficult or painful. Just imagine if we all shared this same commitment to doing everything we can with everything we have. We could put a nice dent in the health issues of this country. What changes would it really make? Maybe it changes the view and perception on people with disabilities, maybe not? Maybe people will eventually realize that health is their responsibility, maybe not? Maybe it just simply shines the spotlight a little brighter on one of my all-time my favorite athletes Kayla Montgomery. Thoughts?